Charles Lindbergh may have shown human fortitude by flying across the Atlantic in his "Spirit of St. Louis," but now he has robotic company when it comes to transatlantic records. An underwater robotic glider built by Rutgers University students and scientists has achieved the first underwater robot crossing, after traveling beneath the waves for 221 days. Rutgers researchers joined some Spanish colleagues today aboard the "Investigador" ship to recover the drone, after launching it on April 27, 2009 off the coast of New Jersey. The submersible bot made its 4,591-mile journey at the slow but steady pace of 4 centimeters per second. Named "The Scarlet Knight" for Rutgers sports — despite its fine yellow appearance — RU27 technically already claimed its transatlantic record on Nov. 14 after 201 days at sea. But the Rutgers team clinched the accomplishment after recovering the scarlet lady, and reportedly gave her a dose of champagne to celebrate. 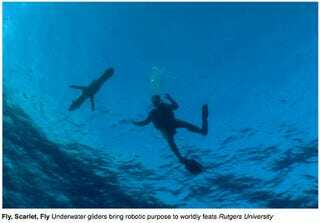 Rutgers University alone has a small underwater fleet of up to seven gliders operating off the coast of New Jersey, with one even cruising around the Antarctic. The U.S. Navy has likewise deployed a number of drone submersibles (not to mention sea mammals), and private companies may also soon send out swarms of underwater explorers for oil prospecting. Looks like Scarlet won't be too lonely the next time she decides to take a dip.